The best lunch in London for £5 (or less) has to be on the river at Camden. Choose from takeaway food from a variety of stalls and find an old motorbike to sit on, facing the water. 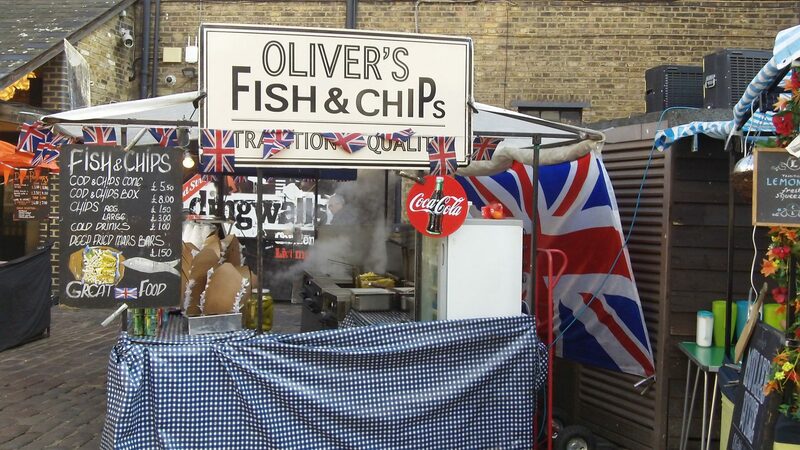 Alternatively, you can go to Oliver’s Fish & Chips, split a large cod and chips for £8 with a friend and still have change – and a waterfront view, if you wander over to the canal. Why is this the best lunch in London? Because it’s all fresh and home-made. The Thai food stall in particular is outstanding. There are ducks to watch. People to watch. And Camden tube (London Underground) station is just a few short hops from wherever you are. Once you’re finished you can go vintage clothes shopping in the market itself, hit the shoe shops on the street or find a bar. Life without maps is much easier. 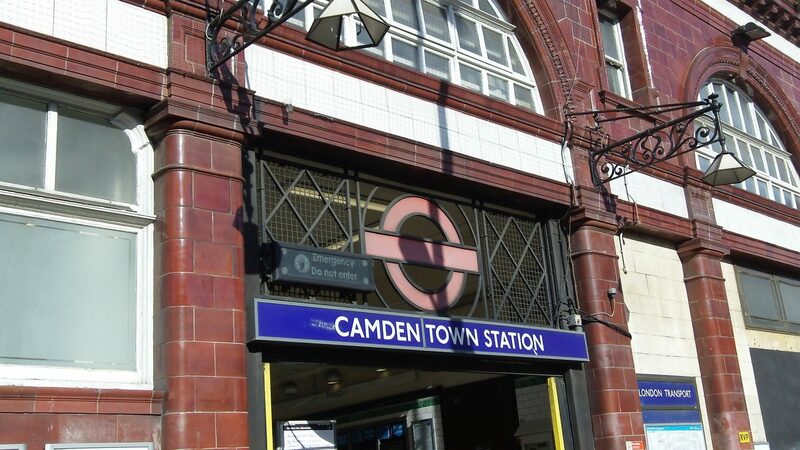 Get on the Northern Line (the black line) to Camden Town Station. Follow the crowds, who will all be walking right of the station in the same direction. Ignore the first market you see – unless you like Keep Calm and Carry On T-shirts. Just keep going until you hit the foodie-friendly part of the market (it’s enormous) right on the water. 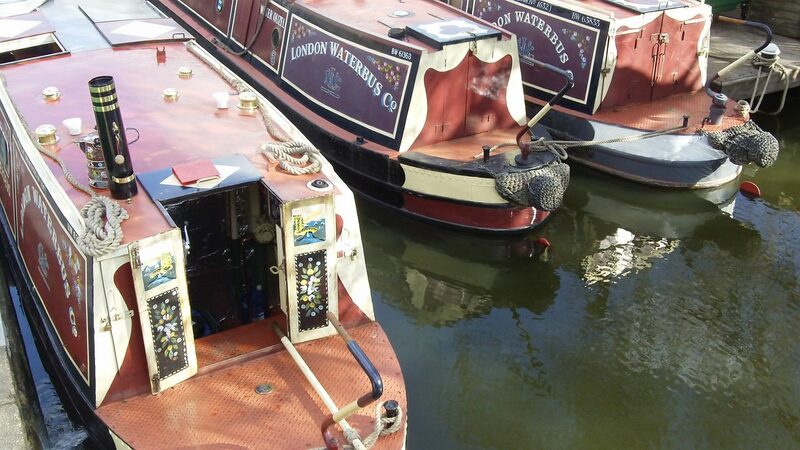 Look out for the beautiful canal boats on either side of the bridge. Wander around left or right of the bridge, and you’ll soon find a £5 lunch. It’s hard to think of anywhere else in London that can compete. It’s not a secret. Everyone knows about Camden. But our tip is to go on a weekday, not a weekend, and aim to eat around 12.00 or 12.30pm to duck the crowds. You’ll also snare a seat with a view of the water all to yourself. Care to disagree with our choice? Tell us your favourite £5 lunch in London at Twitter.